It wasn’t the start to the 2019 NBA playoffs the Toronto Raptors were hoping for. All-star point guard Kyle Lowry was nowhere to be found as the Raps dropped Game 1 of their best-of-seven series to the Orlando Magic by a score of 104-101 on Saturday. Lowry put up 0 points in the affair and was heavily outplayed by Magic point guard DJ Augustin, who had 25 points and 6 assists. Augustin also hit the game-winning three pointer with under four seconds left in the game. The Raptors had a chance to respond, managing to get Kawhi Leonard an open three point attempt, but he couldn’t get it to fall. With Lowry virtually ineffective in this one, it was Leonard and emerging star Pascal Siakam who did most of the heavy lifting. Leonard started hot in the first quarter, scoring 11 points. He finished with 25. Siakam added 24 points and nine rebounds, making his mark on both ends of the floor. The two leading Raptors also connected on a nifty inside passing play in the third quarter. 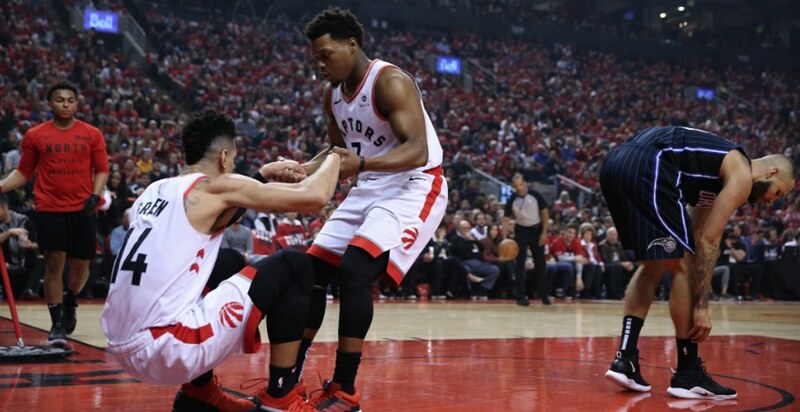 In a season where there has been a lot of hype surrounding the Raptors, who finished as the Eastern Conference’s second seed, Game 1 will be viewed as a disappointment. It also marks another chapter in the franchise’s struggles during series openers. Lowry, who has been accused of not showing up in the playoffs before, will need to shake this one off as he is a key element to the Raptors success. If his struggles continue, it could mean a much shorter offseason than anyone expected. Game 2 with the Magic will tip off in Toronto on Tuesday.